Once you've finished reading this article, you will no longer need to ask how do you play Red Dog Poker to anyone. There's a whole world of Casino games out there that most players know nothing about. Most Casinos focus on Slots, Blackjack, and Roulette - and it's easy to miss some great hidden gems like the Red Dog game. Created as a variant of the (slightly) more popular Acey-Deucey, Red Dog is a fast-paced and luck-based Poker variant you can find at a few brick-and-mortar Casinos and on online gaming sites like this one. 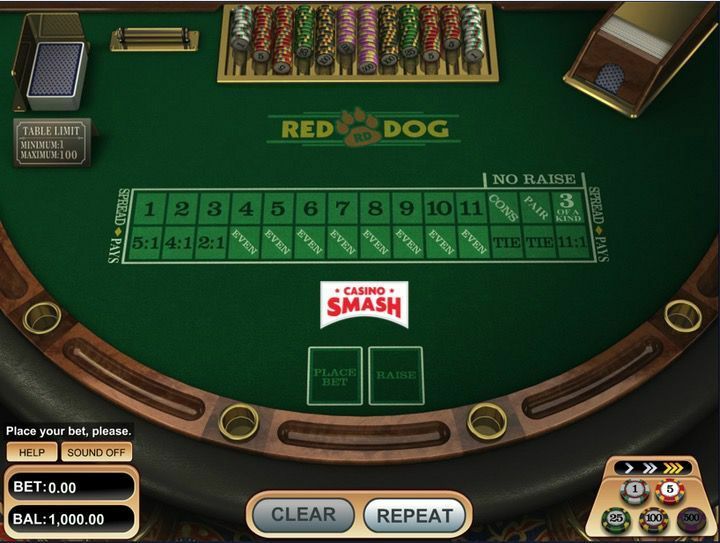 Red Dog is a card game that you can find also under the names of Red Dog Poker and Yablon. Some Casinos in the US use Red Dog to refer also to another game called Acey-Deucey (or In-Between). This is a small mistake since there are a few differences between Red Dog and Acey-Deucey - but that's something people have grown to accept. The official Red Dog game plays with one to eight standard 52-card decks. The number of decks in play has a direct correlation with your winning odds and the house edge - and that's something you'll learn in the "House Edge and Odds" section of this guide. A game of Red Dog needs at least two players to begin and the goal of the game is to have the largest chip stack at the end of the action. Learning how to play Red Dog Poker is very simple. All the cards are ranked as in a standard poker game, with suits being irrelevant and aces always being the highest card in the game. The rules of Red Dog you find in this guide refer to online play. When you play online, you are always in a 1 on 1 battle against the dealer, so there are no other players in the hand. 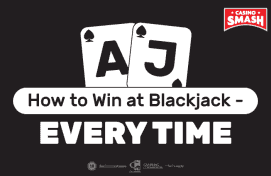 At the beginning of the game, you need to place an Ante bet bet on the table. This betting round takes place before you can see your own cards. When the action begins, the Dealer deals two cards face up, with leaving room for a third on in between them. Once the two cards are on the table, you need to choose whether the third card will fall between them or not. Here's where you need to remember the ranking of hands and keep in mind that the deuce is the lowest card in the game, but the Ace can only be the highest. If you believe that the third card will wall between the two already dealt by the dealer, choose Ride to double your Ante bet and continue with the game. If you don't feel so confident, the Stand button lets you continue with the same bet amount. If the two initial cards are two consecutive ones or a pair, the game ends in a tie and you receive your money back - with no added winnings. But if the first two cards are a pair and the third one leads to a three-of-a-kind, you receive an 11:1 payout! Your best chance to win at Red Dog is to use the spread to your advantage. 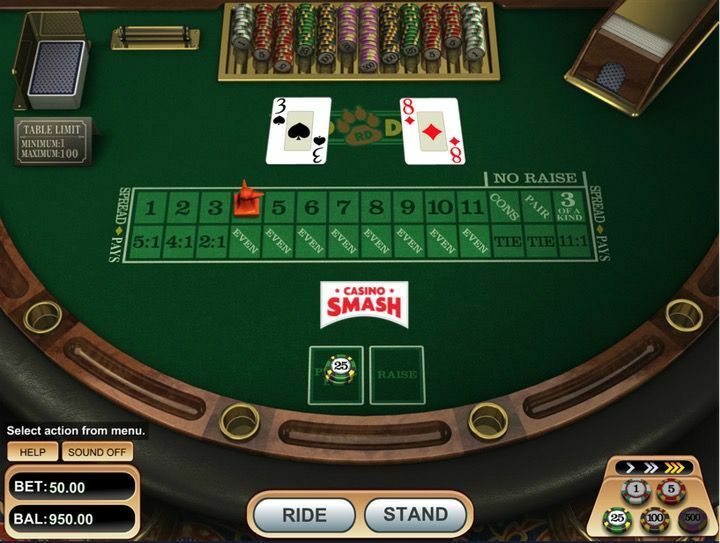 In the game of Red Dog poker game, the dealer needs to account the spread as soon as the first two cards are dealt and they are neither equal nor consecutive. The spread is the difference in values between the two cards. E.g. If the two cards are 4-9, the spread is four because there are four cards between them. Once you know what the spread is, you have info to win your game of Red Dog Poker as the best strategy is to base your action on it. The larger the spread is, the more chances you get to win your hand. As with the majority of Casino games, you can employ a Red Dog poker strategy to increase your chances of winning and keep the house's edge to a minimum. But you need to be smart. Although it is tempting to try to hit the largest wins and continue betting when the spread is of one or two cards - you shouldn't do that. A tried and tested strategy indicates that regardless of how many decks are in play, you have a mathematical edge only when the spread is seven or higher. The house edge in Red Dog is strictly connected to the number of decks used in the game. 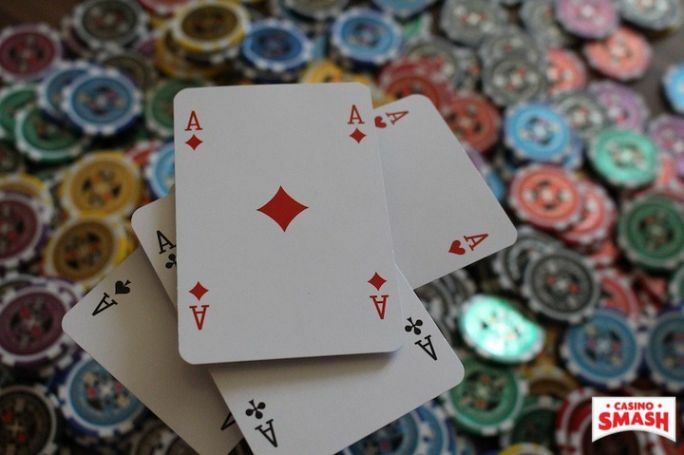 In a game played with just one 52-card deck, the house edge is 3.15%, meaning the Casino has the highest possible advantage it can have in the Red Dog game. The best odds for you are in a game where eight card decks are used, as here the house edge shrinks to 2.75%. In case you want to know how much you can win on Red Dog Poker, here is the official payout of this exciting eight-deck game online.